Medals will be presented to the 1st, 2nd, and 3rd place male and female winners in each age category. 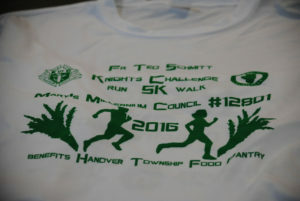 5K Runners & Walkers will receive a technical t-shirt. In addition, the overall male and female winners will also receive special awards. All pre-registered participants in the Kids Fun Dash will be given a participant ribbon, t-shirt, sticker, and other goodies. We can only guarantee t-shirts to pre-registered participants. Pre-registered runners and walkers may pick up their packet on race day from 7:00 – 8:00 AM at the St. John the Evangelist Parish Center.